For those of you interested in the Industrial IoT (IIoT) you may want to check out some new nodes we’ve recently written and released. These are nodes to allow access to the GE Predix platform. We’ve also written a handy tutorial with instructions on how to use these node. 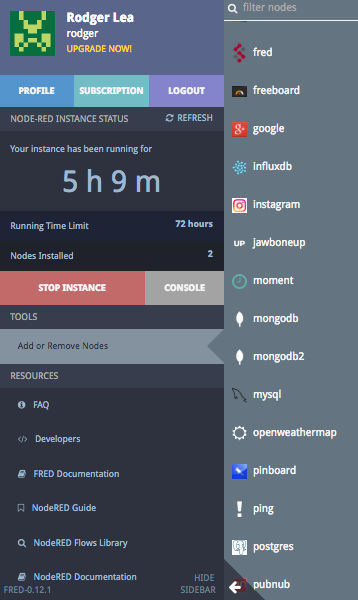 Share your dashboards – paid feature. 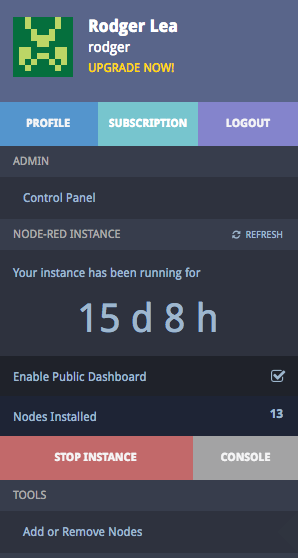 It’s only available to customers on a paid tier, so if you want shared dashboards, or need more than the 50 node limit under the free plan, or hate having to log in every three days to keep your flows active – sign up for the paid tier. You can upgrade to the paid plan by following the “UPGRADE NOW” link in your management panel (shown right). Interested in the technical details of how FRED works? We recently attended the ACM Middleware conference in Trento Italy where we presented a paper at the MoTA workshop on the FRED system. Samsung Artik we’ve updated our Artik nodes to cover the newly released Artik 710 module. If you are using the Artik nodes, download the latest release from NPM. BigTimer Peter Scargill’s ultimate Node-Red Timer with dusk, dawn, months, days, manual override, schedule pause and more. Blynk – a new node to integrate with the popular Blynk IoT app development environment. CKAN – we’ve developed and released nodes for accessing the CKAN OpenData datastore. Tutorial coming soon!